David Knaus: When did you first have some awareness of the creative process? Rita Blitt: My fifth grade teacher introduced me to the magic word “create.” I still get excited when I hear it! DK: How did you start fabricating sculpture as public art? RB: In the early 60s, when the enclosed mall was still a new idea, my husband began developing one. He and the architect, Chris Ramos, asked me to create art for the project. DK: Are you essentially self-taught? Did you formally study sculpture or sculptural techniques? RB: I was trained primarily as a painter, so making sculpture was an exciting new challenge. First I experimented with every material I could manipulate with my own hands — papier mâché, celastic, light weight metal and acrylics. In the 70s, when I began making monumental sculptures from my spontaneous drawings, I needed the help of a structural engineer and fabricators with sophisticated machinery. Together we figured out ways to make my lines exist in space. DK: What was the most challenging sculpture you ever made? DK: And you got it to fit? RB: Yes. We concluded a piece was missing. It was found in Kansas City and immediately air-freighted just in time for the sculpture to be welded together for the center’s grand opening. Each sculpture has its own story. I have learned: The bigger the project, the bigger the frustrations. 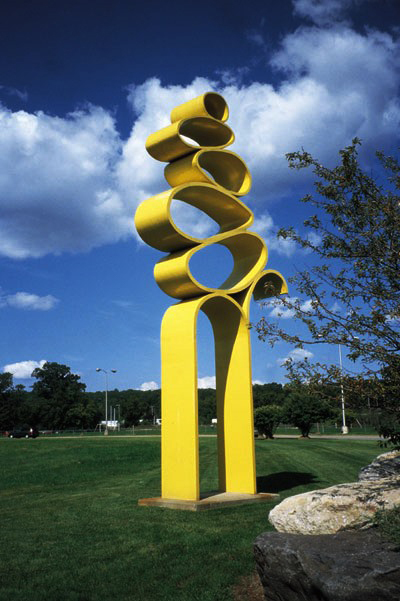 DK: Is there a pivotal sculpture? RB: Yes. My 6-foot 1975 “yellow ball” sculpture. 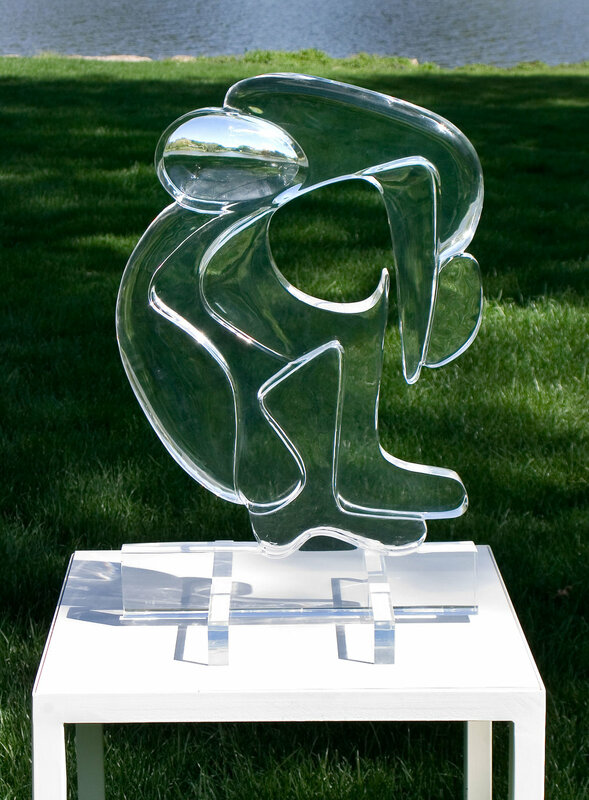 Seeing this sculpture, that came from my little doodle, led to the past 25 years of gestural drawings, paintings and sculptures. DK: Have you ever made a sculpture without one of the spontaneous drawings? In other words, seen it in your head and then created a sculpture based on that? RB: Yes. That’s how I created everything prior to the yellow ball sculpture. DK: Do you have a preference for a particular material? Do you think your work lends itself to one material or another? RB: I prefer steel for monumental sculpture. I like stainless steel because it doesn’t require a protective finish and I can etch the surface. I like corten steel because the rust color changes as the surface ages. It seems very natural and earthy. If I want to paint the surface, I use carbon steel. Bronze is costly but I like to use it for small pieces. For maquettes and small wall sculptures, I usually use wood. And then, some drawings lend themselves to being fabricated from thick acrylic. DK: Material-wise, I think the work you’ve made in acrylic is among the most interesting. I remember your commenting that the orb — the acrylic piece with the hole torn in the center — was the most powerful sculpture you had done and might ever do. Over the years, it seems to me you’ve shown a preference for acrylic over wood or metal. When I was in your studio last month, I made a note after I had left that two or three times, when you were looking at things, you veered away and commented on acrylic pieces that were there. Do you relate to that material because of its transparency? I think the rectangular acrylic with the slit corner, shaped like the crest of a wave (splash.jpg), isone of your most important pieces. RB: I didn’t realize I show partiality to acrylic. I have always been fascinated by its reflective qualities and transparency. Actually, in the early 70s, after only a few years heating and shaping 1/8-inch and 1/4-inch acrylic, I felt finished with the material. Then a shopping center commission led me to the discovery of 2- to 6-inch-thick acrylic, which I occasionally still use. DK: The big stainless steel piece in Aspen, Seeking Truth, where you etched the surface, is absolutely one of the best pieces you’ve ever made. How do you etch the surface of stainless steel? RB: With an electric sander I mark the surface, as if I’m drawing on paper. DK: What was the first work of art that you remember responding to? RB: I recall as a young girl admiring Thomas Hart Benton’s painting Achelous and Hercules, now in the collection of the National Museum of American Art, Washington D.C.
DK: Which artists do you particularly admire? RB: My heroes are Picasso and Matisse. DK: Are there any artists whose spiritual qualities affect you? RB: Yes. I’m especially drawn to the color and serenity of Rothko’s work and the magical line in Charles Burchfield’s paintings. DK: How did your spiritual quest begin? RB: In 1968. At the opening of my first New York exhibit, the New York correspondent for the Kansas City Star took me aside and asked about my spiritual feelings. I murmured some thoughts of God, wondering why he was asking that question. Soon after that, I read M.C. Richard’s Centering, which caused me to begin thinking about my inner self. Then, in 1973, I was shocked when the New York Times book review section reproduced a French drawing from 1844 that looked so much like my wild found-object sculpture, Dance of Destiny that I had just concocted with a ladder, a broom from Thailand, a stainless steel ball meant to hang in a pitcher to keep martinis cold, strips of 1/8-inch acrylic sheet and canvas. After that, I began noticing the incredible synchronicities in my life. DK: You have spoken about the prolificness of the drawings, how many you churned out and that it was bewildering to you. In retrospect now, is it any clearer where your drawings come from? DK: Have you ever produced as big a quantity of drawings in such a short a period of time as you did in the 1970s? RB: I produced so many drawings in the ’70s, ’80s and ’90s that it’s hard to say there were more in one period or another. DK: The circle or a variation of the circle form has always been present in your work. What about that shape appeals to you? RB: It is so satisfying — calm and joyous. DK: You said that you don’t view yourself as a political artist, and yet you seem to be profoundly moved by world events and politics. RB: I am very affected by world events. My concerns for the world must play a part in my work even when it appears to be joyous. Of course, on several occasions I have created works which are obviously political statements. I think one of my most powerful sculptures is Inner Torment, my agonized response to witnessing the homeless at Grand Central Station in New York. DK: If you get up in the morning and hear something disturbing on the news does it translate into your workday? Or, are you able to set it aside and just create independently of that? RB: I find it hard to set anything aside. Therefore, I try not to listen to the news, read the paper or talk on the phone before I create. DK: Do you consider yourself part of the feminist art movement? RB: Equality for women is very important to me. However, at first the movement seemed so anti-male that it was hard for me to feel a part of it. DK: But you had a career at a time when it was very non-traditional to be doing what you did. RB: Creating art was what I wanted to do, what I knew would make me happy. It never occurred to me I was taking a feminist position. DK: Your drawings seem so completely spontaneous. Is there a spark or synergy between the drawings and your life? RB: I’m told that my work reflects my optimism. I am very open and spontaneous. DK: If somebody came to you and wanted to commission you to make a sculpture, would you go back to existing drawings or do you sit down and try to draw something new? RB: I always go back to existing works that were made for the pure love of drawing. I have great faith in them. DK: What do you want to communicate in your more recent work? DK: Is the release you get from the creative process an integral part of who you are? RB: Creating makes me feel fully alive! DK: In your current work that’s related to music, is it a response to the music or an interpretive extension of it? DK: Do you still draw and paint with two hands simultaneously? RB: Yes. Most of the time. DK: In your studio there are so many found objects from nature: a twig, a shell, leaves, a rock — most seem to reference your work. The rock, for instance, is a perfect oval, which reminded me of your oval drawings. Is there a direct relationship between, say, the oval of the rock and the ovals you have drawn? RB: Your question reminds me of the time I went for a walk and picked up a few small branches, hung them on the wall in my studio and was stunned to see that each resembled line drawings hanging near by. The rock’s relationship to my ovals is also coincidental. I think of nature as the greatest art. DK: Your recent paintings and sculptures seem to be very physical, more aggressive and bolder, as though a man has done the work. Any idea why that is? RB: I know they are very physical, but I never thought of their looking like a man might have done them. That’s interesting! My studio, built in 1989, gave me an incredible sense of freedom; I believe this brought new strength to my work. Also, I’ve become more confident through the years. The work is very energetic and coming from a deeper level within me. DK: Why did you abandon realism in the 1960s for abstraction? RB: During the early 60s, in order to feel honest, I insisted that my inspiration be taken from reality — even if the painting ended up looking quite abstract, such as Sunlight on the Water. It was only after working with pure shapes while making acrylic sculpture that I would allow myself to make paintings that were not related to real life. DK: Why do you think the painting Sea Gulls and Ocean I is one of your most important? RB: This was the first time I painted with such freedom. Also, it was the first time I painted nature inside rather than on site. DK: Why do you like to paint large? RB: I like to move — to reach out in large gestures as far as I can. DK: Do you paint the same way you draw, that is, very quickly and spontaneously? Or do you spend weeks working on the same painting? RB: My paintings are usually created very fast. Sometimes I wish they took longer. DK: The use of color comes and goes in your work. Is there a reason for that? Is the attraction to black the simplicity? RB: Probably so. I like to eliminate all that is superfluous and get to the essence. For years I painted only with black. One bold gesture seemed to say everything. DK: I know you’ve gone back from time to time and added color to works that were originally created in black. Was that just spontaneous gesture? RB: In 1980, when I first added color with pastels to my black line drawings, I really forced myself to do it, remembering how much I loved working in color. When I added color to my 1996 black line paintings, which I had thought were finished, I worried for a long period of time before touching them. Today, when I add color to my black lines, I often think of it as ‘having a dialogue’ with my original brush strokes. DK: Do you always start with the black lines and then add color or do you ever put the color down first and then add black lines? Or not add black at all? RB: I’ve experimented with all of these ideas. In 1997, I began loading the paint brush with several colors, making the resulting color as much a surprise as my brush strokes. DK: Have you ever desired to paint sculpture the way you paint on canvas? RB: Sure. In the early 1960s I painted my shaped, suspended canvas sculptures with abstract-expressionist brush strokes while they moved in space. That was a pretty wild experience. 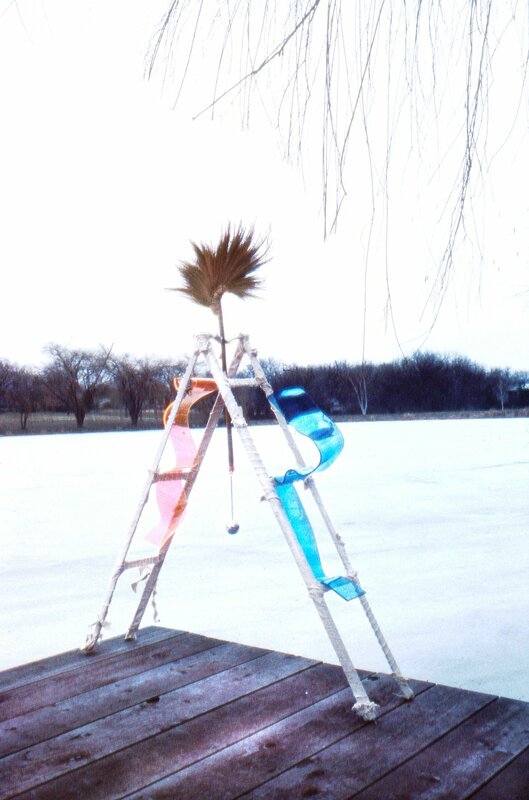 And then in the 1990s, I had fun attacking three 5-foot metal sculptures with spray paint. DK: Do you consider yourself a painter who creates sculpture, a sculptor who creates paintings or do you make that distinction? RB: I was a painter before I ever started creating sculpture. So usually I think of myself as a painter who makes sculpture. DK: Do you see a difference between designing sculptures for your own enjoyment as opposed to commissions for a shopping center or a building? RB: Only in size. Strangely enough, my drawings seem to translate into any size sculpture. DK: What impact has religion had on your art? RB: It would be easier for me to say what impact my art has had on my religion, because through creating, I have discovered spirituality. DK: In the 20 years I’ve known you, you are always searching, trying new materials and methods. Are you looking for an ideal expression or meaning? RB: No. I’m just always ready to grow, to follow my deepest inspirations, and, above all, to enjoy.